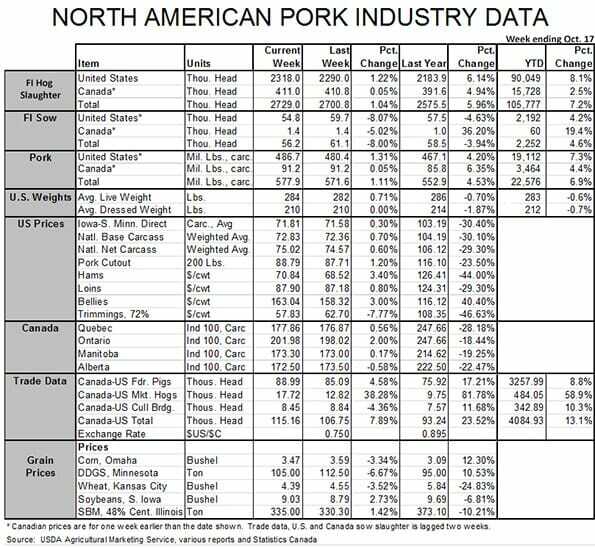 US - After submitting my column last week, I realized that the numbers I presented for August exports were very different from the numbers in the U.S. Meat Export Federation press release on the same topic, writes Steve Meyer in the National Hog Farmer. A bit of investigation and a visit with USMEF staff pointed out the culprit. My column, as usual, was based on carcass weight equivalents for muscle cuts. The USMEF’s total export number is in product weight and includes variety meats and hog sausage casings. The discrepancy was caused by a large decline (31 per cent ) in pork variety meat exports from one year ago. The USMEF points out, though, that the USDA’s year-ago figures are exaggerated by an unexplained “surge” of exports of pork intestines to Japan. That increase is almost certainly an error but neither the USDA’s Foreign Agricultural Service, nor the Customs Bureau have determined what the obviously misclassified product was. Result: A 1 per cent decline in August exports according to the USMEF’s aggregation. The increase we reported for muscle cuts is correct, however. The August export data was also the last piece of information we needed to close the book on August pork demand measurement. The results were good but certainly not great as domestic real per capita expenditures for pork increase just 1 per cent from its year-ago level. The monthly total of $15.80 year-2014 dollars (see Figure 1) was still 10.3 per cent above the average for August from 2010 through 2014. It also put year-to-date RPCE at $127.20, still up 5.3 per cent from one year ago through August and 14.4 per cent above the five-year average. Four of the past five months have seen year-on-year RPCE growth in the 1 per cent range. May, of course, was the first month since January 2014 in which RPCE had not exceeded year-ago levels. Am I concerned about these slow gains? Not really. The primary reason for that lack of concern is that I expected them and the main reason for that low expectation is that I just didn’t think pork demand could maintain the growth pace of the past two years forever. It is simply difficult, if not impossible, to maintain growth at the 5.5 per cent and 7.6 per cent paces we have seen the past two years. 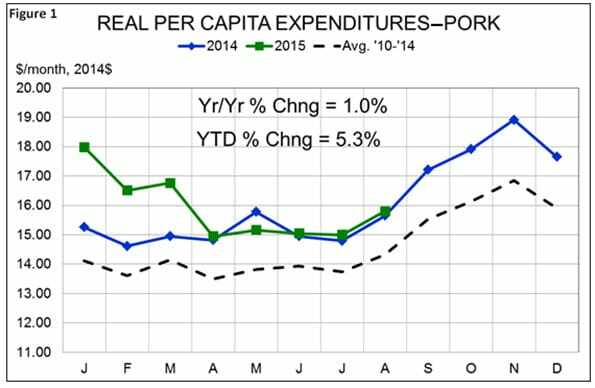 Where pork demand was once being driven by large yearly increases in nominal and real retail prices, the driver for 2015 is per capita consumption. Double-digit year-on-year increases in five of eight months so far in 2015 have pushed per capita disappearance/availability/consumption up 9.3 per cent versus 2014 so far this year. It is good news that U.S. consumers have taken that much more product. But the great news – and the piece that means demand has continued to be strong – is the fact that they have taken the larger volume at very good prices. In fact, real retail pork prices are down only 3.2 per cent from one year ago. I would have expected them to be down somewhere near 15 per cent had demand been stable. September retail prices, according to the USDA, remain very strong (see Figure 2) with the average retail pork price gaining 8.5 cents per pound (2.9 per cent ) from August’s level. The nominal price of $3.919 cents per pound was the highest since February and is 2.2 per cent higher than one year ago. The September retail price bodes well for September demand-RPCE calculations. With higher production, exports would have had to grow sharply in September for domestic per capita pork usage to fall by much – and perhaps not at all – from year-ago levels. If that is in fact the case, the September calculations could show larger year-on-year gains for RPCE than we have seen since March. Those March figures were, in my opinion, a bit overstated because product was not being exported in a timely manner and thus showing up as disappearing from the U.S. market when they were, in reality, likely sitting in warehouses and containers awaiting shipment. 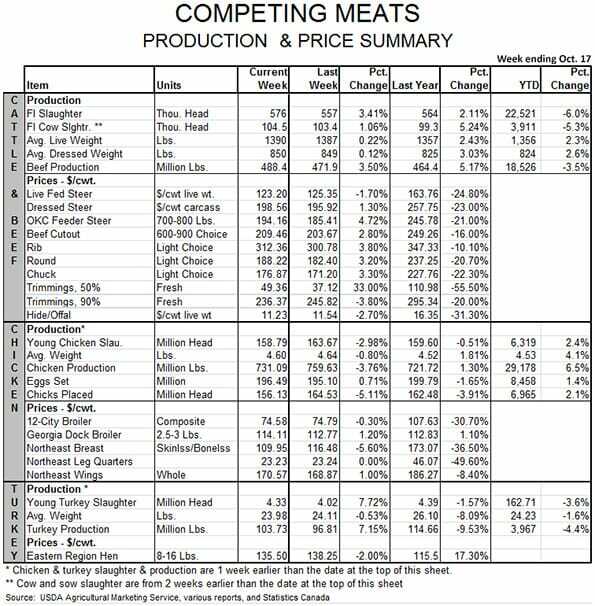 Beef and chicken RPCE remained strong in August as well, gaining 4.0 per cent and 10.2 per cent on year-ago levels. 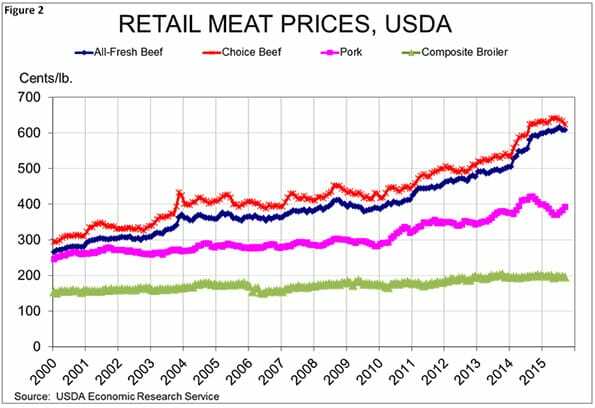 RPCE growth for all three species speaks well of the status of total protein demand and the continued positive position of meat proteins in American’s diet and eating plans. What a difference from just a few years ago.